The Ninapro Project database web interface. The application of modern machine learning techniques to analyze sEMG activity related to natural movements seems promising but it is far from practice due to two main aspects. First, the effects of the amputation on the nervous system of the subjects are not fully clear; second, there is a strong lack of control robustness. In recent years, some scientific papers showed that the combination of visual and electromyography data can strongly extend the capabilities of dexterous prostheses. With MEGANE PRO, we aim to bring the research in this field to its next step, i.e. to better understand the neurologic and neurocognitive effects of amputation on the persons and to strongly improve robotic prosthesis control possibilities by hand amputated subjects by symulating eye-hand coordination. MEGANE PRO will be the first multimodal database from intact and hand amputated subjects mixing several different data sources to improve patient rehabilitation and neuro-cognitive understanding. The project includes also the application of machine learning algorithms on multimodal data in order to perform movement classification for prosthesis control. The combination of multimodal data is expected to strongly improve the movement classification accuracy, and therefore the concrete capabilities of hand prosthetics. Finally, the project is expected to improve the knowledge in the neuro-cognitive field by studying differences between intact and hand amputated subjects. 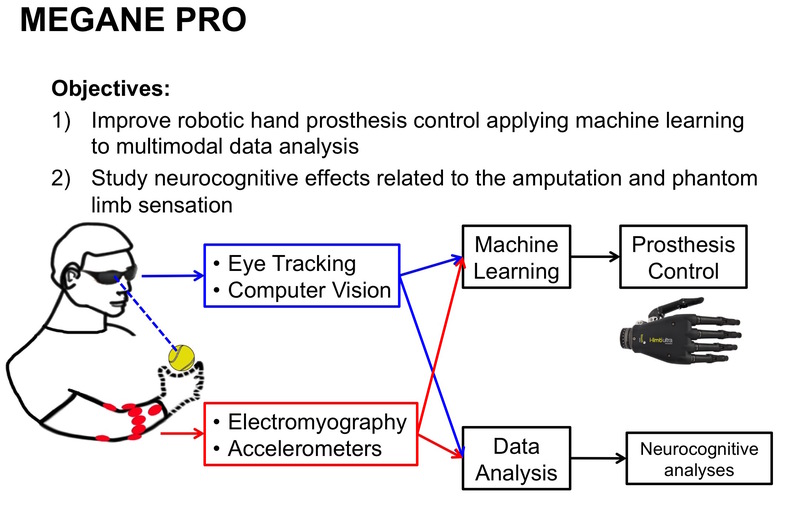 Thus, we expect MEGANE PRO to strongly improve the state of the art in hand prosthetics and to improve the clinical outcome of the patients (e.g., by better understanding the individual phantom limb phenomenology). MEGANE PRO is funded by the Swiss National Science Foundation through a Sinergia grant. F Giordaniello, M Cognolato, M Graziani, A Gijsberts, V Gregori, G Saetta, AG Mittaz Hager, C Tiengo, F Bassetto, P Brugger, B Caputo, H Müller and M Atzori, Megane Pro: myo-electricity, visual and gaze tracking integration as a resource for dexterous hand prosthetics, in: IEEE International Conference on Rehabilitation Robotics, London, UK, 2017 .